The White Barn venue sets in Southeast Indiana resting near the Ohio Rover and beautiful Historic downtown Madison Indiana. 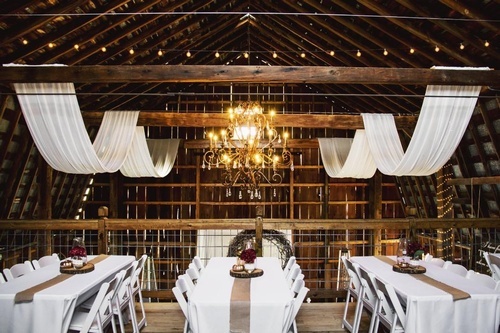 This 1800's barn provides rustic charm with a touch of chic elegance. Resting on 49 acres of rolling countryside and seated on the Dews Family Farm this unique venue includes a large open loft overlooking the lower level. Barn seat up to 160 guests in the barn and can accommodate larger guests with overflow tents. 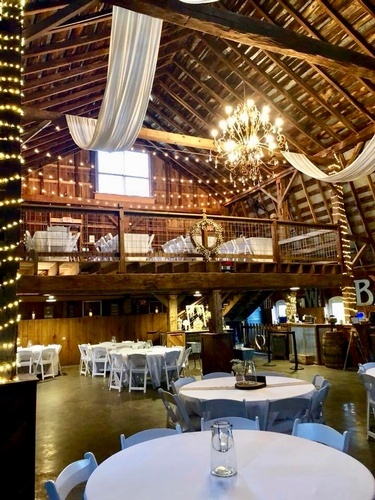 The atmosphere of the barn offers hand hewn beams from the late 1800's, as well as a beautiful grand chandelier lighting making this a warm ambience of romantic country charm for your very special day. The venue is a stunning setting with endless possibilities and is sure to create memories that will last a lifetime!